The Hawx Magna 90W is the top custom ski boot for women in our new wide-fit Hawx Magna series. This new series means for the first time ever you can get the legendary Hawx feel and features in a boot with a 102mm fit. This is a massive step forward for wide fits. It’s the lightest boot in its class. It’s packed with features for wider feet like the easy step-in zone and a wide tongue. It comes with Memory Fit for a fully personalized shell, cuff and liner in minutes. With Power Shift you can adjust your forward lean and alter your flex index + 10 flex points to suit you, while the Silver liner features 3M™ Thinsulate™ Platinum Insulation to keep your feet warm and responsive. A great wide-fit boot for all levels of skier – and most importantly, a great Hawx. Atomic Hawx Magna 80 W is a wide-fit Hawx Magna boot tailor-made for women skiers – offering the legendary Hawx feel and features in a boot with a 102mm fit. It’s the lightest boot in its class too, and packed with features purpose-built for wider feet like the easy step-in zone and a wide tongue. It has a soft flex for intermediate skiers. The Silver Liner also features 3M™ Thinsulate™ Insulation to keep your feet warm and responsive even in extremely cold and damp conditions. A great wide-fit boot – and most importantly, a great Hawx. Bootfitter’s comments: A wide-fitting boot with a smooth 80 flex, the Hawx Magna 80 is a great option for those looking for all-day comfort in all conditions. Ideal for first-time buyers through to intermediate cruisers, we’re expecting the Hawx Magna to be a bestseller again this season. Atomic Hawx Ultra 90 W is one of our top Hawx Ultra boots for women – a new range with the legendary Hawx feel now in a narrow 98mm last. It comes with a medium flex that’s ideal for advanced female all-mountain skiers. It features Memory Fit for the personalization of a custom ski boot in minutes, plus 3M™ Thinsulate™ Insulation to keep your feet warm in all conditions and a Memory Fit 3D Silver liner with pre-shaped heel and ankle areas for an even better first fit. Hawx Ultra is also the lightest alpine boot range we’ve ever made! The reason it’s so light yet powerful: a radical new Progressive Shell that adds reinforcement in key zones but reduces wall thickness overall to cut weight, combined with our Energy Backbone – a reinforced, asymmetric backbone that provides extra strength and edge grip for powerful skiing. These boots also feature Power Shift, Cuff Alignment and our new Cantable Grip Pads for complete customization. Bootfitter’s comments: The Hawx Ultra 90 is a serious, high-performance alpine boot, in a lightweight, highly adjustable package. The 90 flex hits the sweet spot for a wide range of users, while the light weight and Memory Fit custom shell offer a precise, personalised fit. Atomic Hawx Ultra 80 W is the softest and most forgiving women’s boot in our new Hawx Ultra range, offering the legendary Hawx feel and comfort in a narrow fit. It comes with Memory Fit for the personalization of a custom ski boot in minutes, plus 3M™ Thinsulate™ to keep your feet warm in all conditions, and a Memory Fit 3D Silver liner with pre-shaped heel and ankle areas for an even better first fit. The Hawx Ultra has another trick up its sleeve too – it’s the lightest alpine ski boot we’ve ever made! The reason it’s so light yet powerful: a radical new Progressive Shell that adds reinforcement in key zones but reduces wall thickness overall to cut weight by 25%, combined with our Energy Backbone – a reinforced, asymmetric backbone that provides extra strength and edge grip for powerful skiing. These boots also feature Power Shift, Cuff Alignment and our new Cantable Grip Pads for complete customization. With its medium flex, the Atomic Hawx Prime 90 W is the ideal custom ski boot for advanced female skiers. This legendary Hawx medium fit comes with a cuff height and liner construction tailored specifically to suit women’s feet. We’ve integrated Memory Fit so you can personalize your shell, cuff and liner in minutes. The boot features a new Memory Fit 3D Silver liner with pre-shaped ankles for an even better first fit. You also get 3M™ Thinsulate™ Insulation to keep your feet warm and responsive even in extremely cold and damp conditions. On the outside, Sole Flex technology on the sole of the boot enhances your balance, underfoot feel and control. While the option of WTR Grip Pads means easy walking, too. Bootfitter’s comments: Atomic calls the Hawx Prime the bestselling alpine boot of all time, and while we haven’t checked their figures, we can confirm it is an established favourite with our customers. Featuring a natural, upright stance, medium-volume 100mm forefoot, and a responsive 90 flex, the Hawx Prime 90 is a great option for intermediate to advanced skiers. With its medium flex, the Atomic Hawx Prime 80 W is the ideal custom ski boot for intermediate female skiers. This legendary Hawx medium fit comes with a cuff height and liner construction tailored specifically to suit women’s feet. We’ve integrated Memory Fit so you can personalize your shell, cuff and liner in minutes. The boot features a new Memory Fit 3D Silver liner with pre-shaped ankles for an even better first fit. You also get 3M™ Thinsulate™ Insulation to keep your feet warm and responsive even in extremely cold and damp conditions. On the outside, Sole Flex technology on the sole of the boot enhances your balance, underfoot feel and control. While the option of WTR Grip Pads means easy walking, too. Bootfitter’s comments: All the proven performance and customisation of Atomic’s bestselling Hawx range, in an easy-going 80 flex, the Hawx Prime 80 offers a great platform for first-time buyers and improving intermediates. Memory Fit shell allows us to tailor the fit to your foot! The top performance women’s Krypton model, the Kryzma I.D. has been developed for aggressive and accomplished expert skiers who can ski anywhere on the mountain. Close fitting Contour 4 shell design, completely customizable dynamic performance characteristics: flex control, forward lean, dual canting, interchangeable tongues & footboards. High Density ID Thermo "Pro" Lady Custom Fit Liners are standard equipment for incredibly lightweight comfort with exceptional warmth, shock absorption, and firm foothold. Bootfitter’s comments: One of the highest performance ladies’ boots out there, the Kryzma is a proven bestseller. Offering a low volume fit, stiff flex and precise, custom liner, this boot is built to charge all over the mountain. The AVANTI 95 ID is a high performance model for advanced to expert women skiers featuring high tech good looks and innovative architecture. Bootfitter’s comments: A high-performance boot in a traditional 4-buckle design, the Avanti 95 features a fully customisable liner for a truly personalised fit. Bootfitter’s comments: A great option for advanced skiers seeking a combination of comfort and performance. The Form Fit shell customises to your foot shape, while the adjustable flex index allows us to tune the boot for almost any performance level. The K2 SpYre 110 ski boot, featuring a women’s specific last, is the most aggressive, highest performing, stiffest boot in the collection. It is made for expert women skiers with the Energy Interlock, PowerFuse SpYne, and molded and lasted PrecisionFit INTUITION® liner. Now offered in a 97mm (LV) and 100mm last so the width and shape of your foot no longer dictates what boot you wear. Bootfitter’s comments: Offered in two width fittings, the Spyre 110 is a no-compromise high-performance boot for expert skiers. Custom mouldable liner offers a precise fit. Offering a forgiving yet powerful 100 flex on the highest performance platform, the Spyre 100 ski boot is matched with higher volume last options, 100mm or 102mm, LuxFit INTUITION® liners, replaceable outsoles and padded mid-grips for all day comfort and performance. New for 2017/2018, the Spyre 100 is now available with a heated liner! Bootfitter’s comments: Offering the same features as the Spyre 110, but with a softer flex, wider fit option and a more comfort-oriented liner, the Spyre 100 is our best-selling ladies’ boot from K2. Accessible performance for advanced skiers. For ultimate luxury and comfort, why not upgrade to the heated model? The GPX 95 W was designed by skiers for skiers, as the new Nordica standard in women’s all mountain boots. Built with our anatomical 98mm mono injected PU last, all new handcrafted Primaloft Race liner and soft grip soles, the GPX 95 W was engineered to meet the particular biomechanical shape of woman’s lower leg. Both the liner and cuff have their own specific construction to optimize both on snow comfort and control that heighten the all mountain experience. Bootfitter’s comments: Still offering the precise fit of the Dobermann, but with a softer flex, plusher liner, and softer sole for optimal all-mountain performance. A great choice for advanced female skiers. Twin-Frame performance and Oversize Pivot combine with pre-shaped 3D liner and women's fit, to give X Pro 80W superior energy transmission and all day comfort. 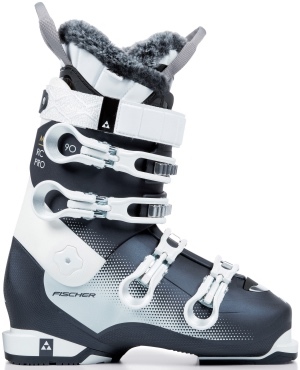 Bootfitter’s comments: All mountain performance and comfort from Nordica’s updated Speedmachine shape. The 115 flex offers awesome response, while a fully customisable shell and liner allow your bootfitter to dial in the fit and ensure you ski in comfort all day long. Bootfitter’s comments: We’re excited to get our hands on the Sportmachine range this year, following the success of Nordica’s Speedmachine boots. The Sportmachine features all the same technology, but built around a wider last to offer a more relaxed forefoot fit. For advanced skiers looking for a comfortable boot, this will be a great option! Bootfitter’s comments: The new Sportmachine 85 is geared towards intermediate skiers who are seeking ultimate comfort. The generous forefoot fit, forgiving 85 flex and plush liner add up to a luxurious package that will make this a perfect boot for first-time buyers. Bootfitter’s comments: Phenomenally popular every year, the Cruise’s generous shell shape gives great comfort, while the 85 flex still allows it to offer performance to intermediate/advanced skiers.